There are Facebook Live livestreamed videos and 360 video 360-degree videos, and now, there is Live 360. Product manager Supratik Lahiri and software engineer Chetan Gupta announced in a Newsroom post that Facebook will launch Live 360 video Tuesday (Dec. 13) at noon PT/3 p.m. ET, with National Geographic going live from the Mars Desert Research Station facility in Utah as eight space scientists emerge from 80 days of isolation. 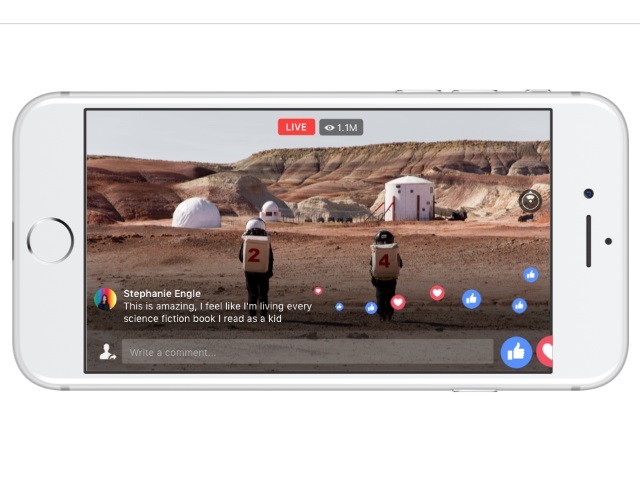 According to Lahiri and Gupta, Live 360 will be made available to more pages via the Facebook Live API (application-programming interface) “in the coming months,” with an eye toward rolling the feature out for all pages and users in 2017. Live video on Facebook gives people an immediate, authentic window into what’s happening in the world right now; 360 video immerses viewers fully into the scene, letting them explore on their own and experience a new environment. We’re combining these two formats with Live 360 video. Live 360 transports people into new experiences—right as they happen. Over the past 80 days, eight space scientists from around the world have lived in pods simulating every aspect of life on Mars, including total isolation from humanity. As part of its global effort around Mars, National Geographic will be live on Facebook in 360 degrees as the scientists emerge from the pods. They will take you behind the scenes to explore the living quarters, see how the scientists suit up in their space suits and take a rover out for a spin across the Martian landscape. This first Live 360 will also include a Q&A with a lineup of science experts, writers and thinkers, and will take questions from the Facebook audience. Readers: Are you excited to see Live 360 video on Facebook?